Notoriously, David Cameron recently admitted to his inquisitor Jeremy Paxmanthat he did not know how many food banks there were in the UK, a clear sign, many concluded, that when it comes to poverty he is desperately out of touch, incompetent, in denial, or all three. He did not know, or think to say, that no-one else knows exactly how many there are either (best estimates are in the thousands). But then food banks provokeblind panic in the Tories: they can’t decide whether they admire or despise them; they fear them and with few exceptions, their default position is to try to ignore them. Of course, food banks tell us that they work so hard precisely primarily because government policy – benefit sanctions, delays in benefit processing, and so on – generates so much demand for food parcels. But that is precisely the insight the coalition has been so desperate to suppress. 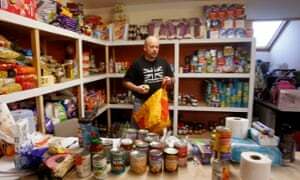 Food banks, they know, may be Big Society incarnate, but they are toxic to the austerity project. This entry was posted in food banks and tagged Charities, food banks, welfare cuts. Bookmark the permalink.